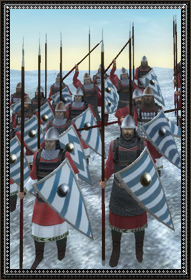 Skutatoi, a solid spearman unit, and their brethren swordmen Spathatoi formed the backbone of all Roman infantry forces. Skutatoi wore a reinforced iron or bronze helmet with both a scale or leather aventail and also a scale or mail gorget. As armor they wore an “bambakion” padded cotton cloth gambeson (probably more than ¾ of an inch in width). Above that, a “klibanion” light lamellar corselet is worn reaching down up to the belt. They all carried a big triangular shield, emblazoned with geometrical shapes or lines. Their tactical role was versatile. Initially they formed a shield wall against the light Arab cavalry, and used their spear both against cavalry and infantry. Their tactical role at present would whatever their commander orders. Charge in a valley or in city walls, defend against horsemen, all in a days work. They are standard troopers, however and shouldn’t be pushed out of their limits or they will break. As heavy horsemen emerged much of their previous defense role was transferred to Kontaratoi, but still they make perfect flank guards. The real power behind the Eastern Roman Army wasn’t its shiny Kataphraktoi or Stratiotai. It was the Skoutatoi spearmen and their brethren Spathatoi swordmen. They were a solid infantry unit which became the backbone of all Roman armies during the renaissance of its might in the 9th and 10th centuries. Now, with the devastation brought upon the empire with the Turkish occupation of the Anatolian provinces, their equipment suffered as well with boiled leather replacing metal. Manuel Komnenos, however, especially after his victory at Sirmion over an all horsemen Hungarian army reinvigorates those spearmen, enhancing their equipment. This unit really demonstrates the fusion of cultures and heritage of both Ancient Greeks and Ancient Romans. The other names this unit would have, aka “Tagmatikoi hoplitai” are just proof of that heritage. The name they now have comes from the latin word “Scutum” meaning “shield”.